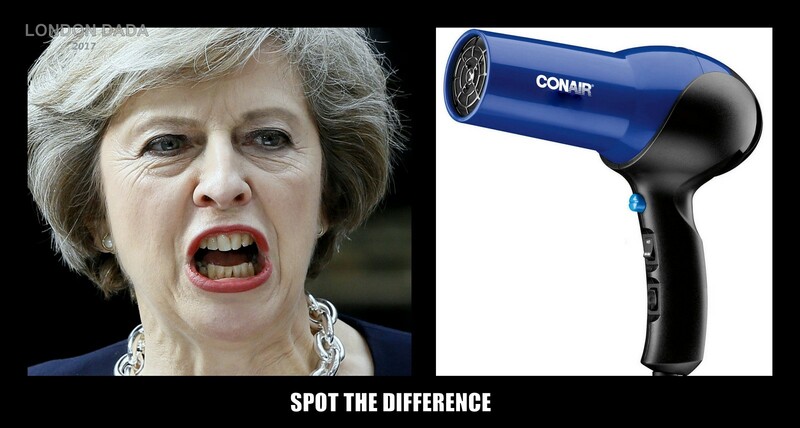 May the hot air blower vs. the ConAir (yes really ) Turbo hair dryer. Found object juxtaposed. Looking to the Coniston fells, Lake District, Cumbria. John Ruskin, artist & Victorian polymath, lived at nearby Brantwood during the last 28 years of his life. 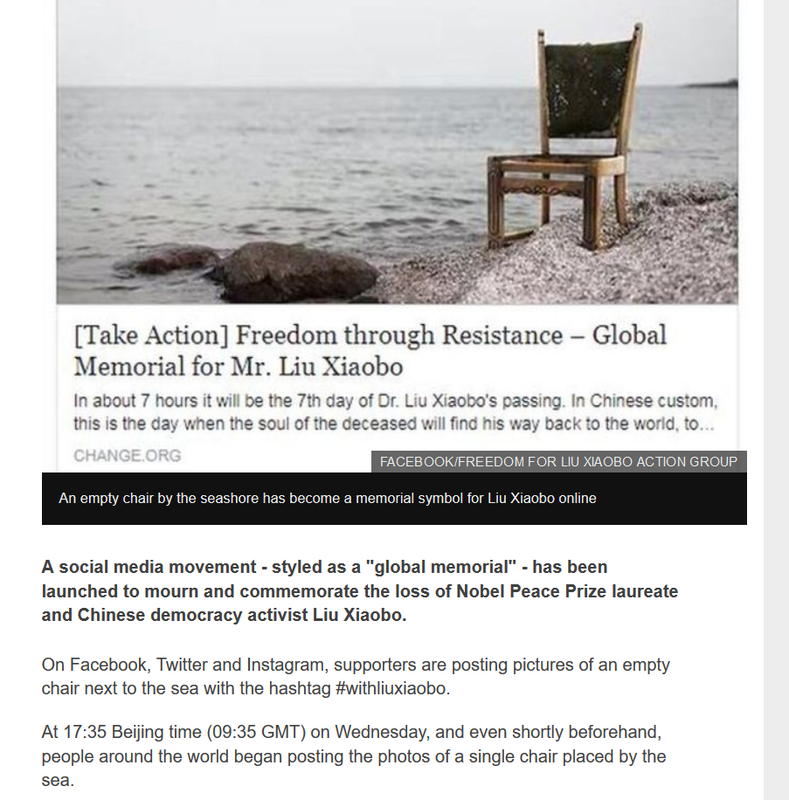 Update; only a few hours after posting the above image and at c. 21.30 GMT, friends of Chinese democracy activist Liu Xiaobo who had sadly died in custody of liver cancer at age 61, posted this memorial photo on their Facebook page. 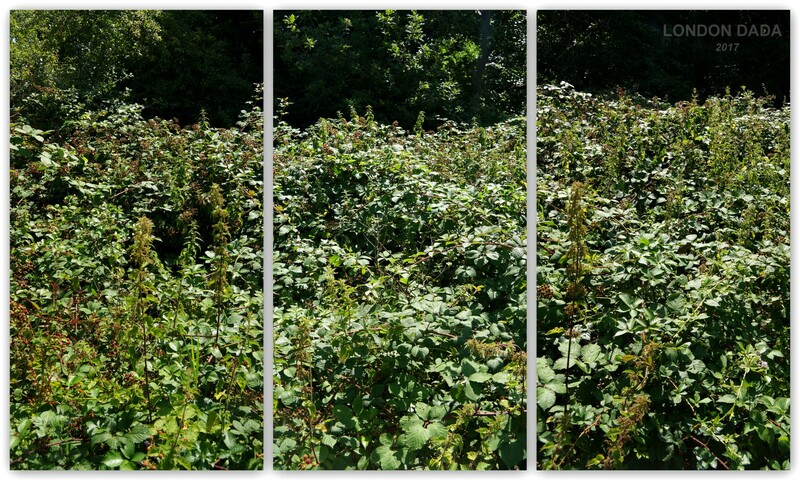 Serendipity doesn’t get much more amazing..
England in July well away from the horrorshow holiday mayhem going on in the distant background, the wild vegetation mix mantle assumes a strikingly similar shade of green – the most relaxing of colors. 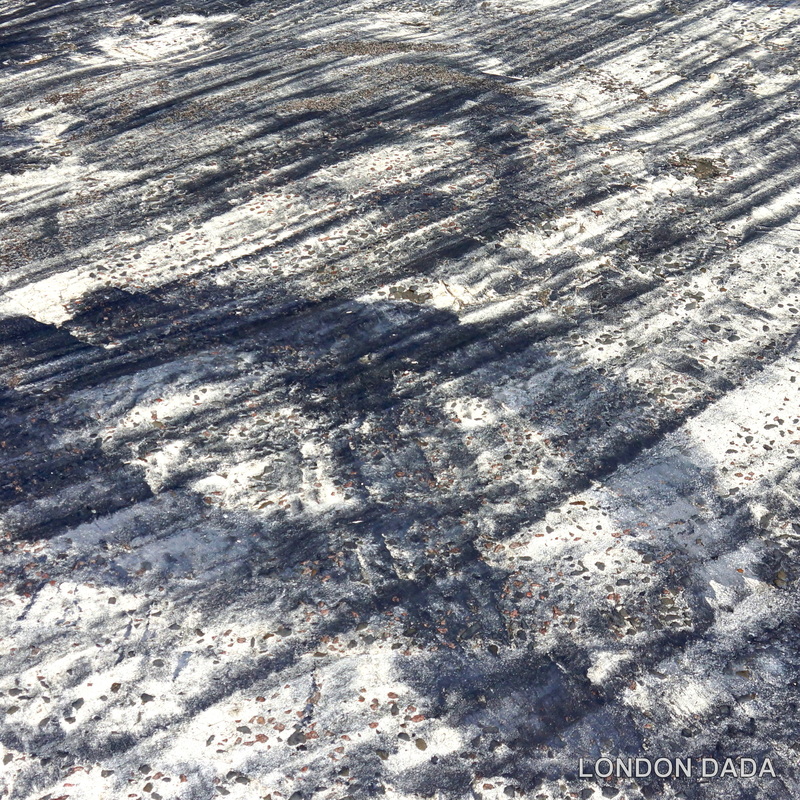 Third in the innovative LD series of separate cropped scenes derived from an incremental pan of the same scene, that enhanced the photo triptych genre. 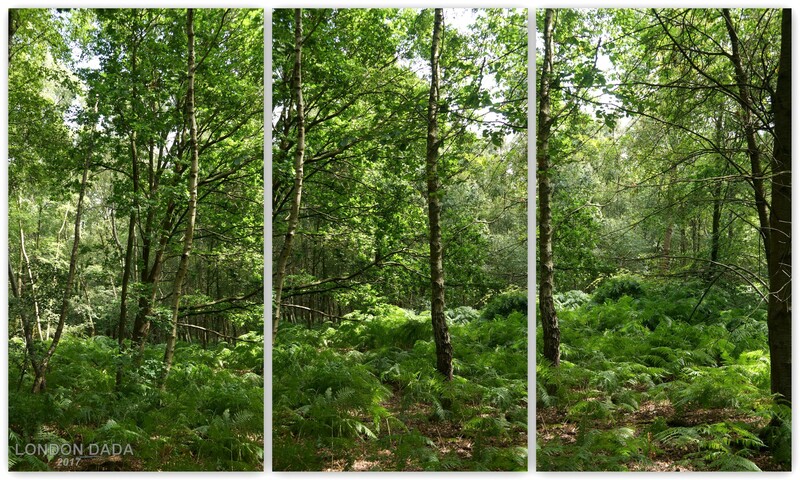 Selected three-shot portrait pans in AO woodland near South Mimms, Herts. The UK summer of 2017, disturbing events rendering it dark in most every regard. Audi car, color black. 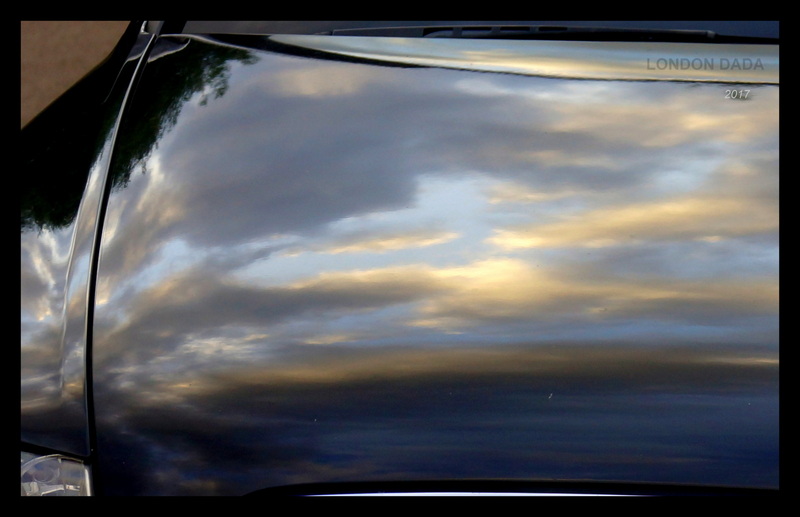 Photographic image crop of engine bonnet reflecting the summer sky above Muswell Hill, London N. Image pre-framed in black. Impossibly overcrowded roads making driving almost anywhere in England now an energy-sapping patience-pushing endurance test. 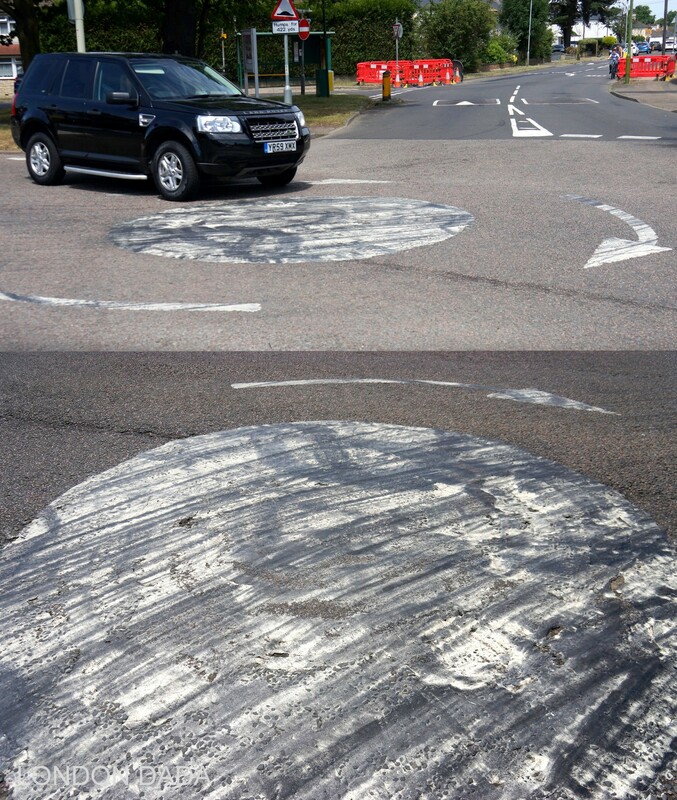 Pretty much everyone’s aware that stepping behind the wheel is a major stress, aggression and annoyance factor in their Everydays.. yet no one in politics, the MS media or art establishment wants to acknowledge or even touch on the rampaging elephant in the room. Signed editions each of 20 Lightjet prints on Kodak Pro Endura. “I am building the largest sculpture I have ever built in my life, 15 x 15 x 8 feet. 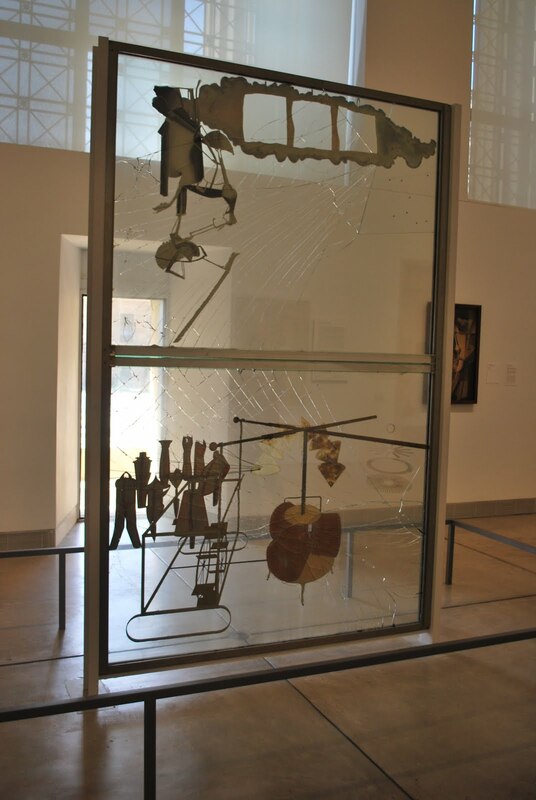 It is an indoor sculpture and my third Merzbau, now that the first one was destroyed and the second one unfinished …. I don’t know how I shall ever be able to finish it… but I have great courage and it works like magic …. I work three hours a day, that’s all I can manage. I sleep ¾ of the day in order to gain enough strength for the remaining ¼. I work every minute I can. 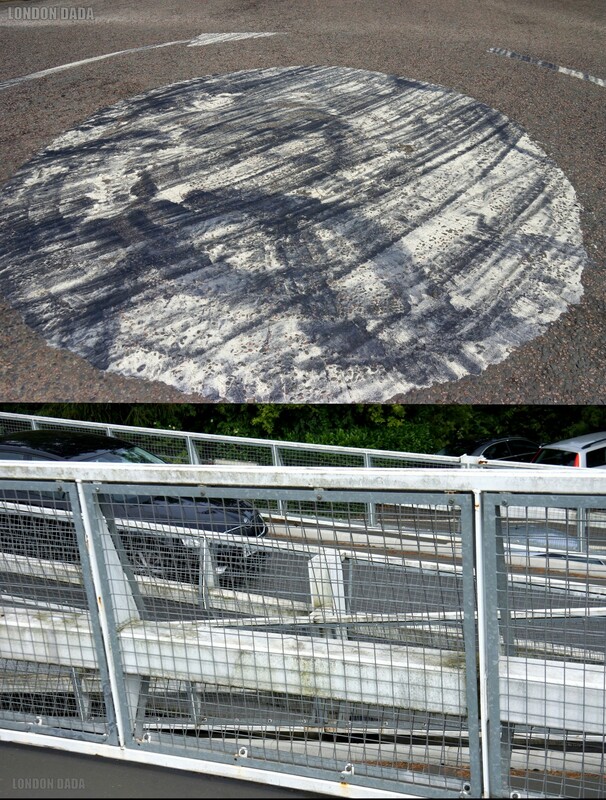 July 7th 2017; artist Michael St.Mark calls for the return of the main part of German Dadaist Kurt Schwitters‘ “Life’s Great Work”, his Merzbarn’s wall, now languishing as an unnatural decapitated artwork, stranded like a fish out of water for over 50 years in the Hatton Gallery Newcastle, over a hundred miles away from its true home in Elterwater Great Langdale Cumbria, where the artist surely intended it to rest forever as an integral part of the Merzbarn which is still standing on the original site. The return of the Merzbarn’s west wall complete with its unfinished Merz sculpture obviously requires accompanying adequate Arts Council or other funding in order to then preserve it and secure the site of Merzbarn in Elterwater for the benefit of future generations of students and art lovers, who will be able to view this important and unique Dada work in its intended location and environment. 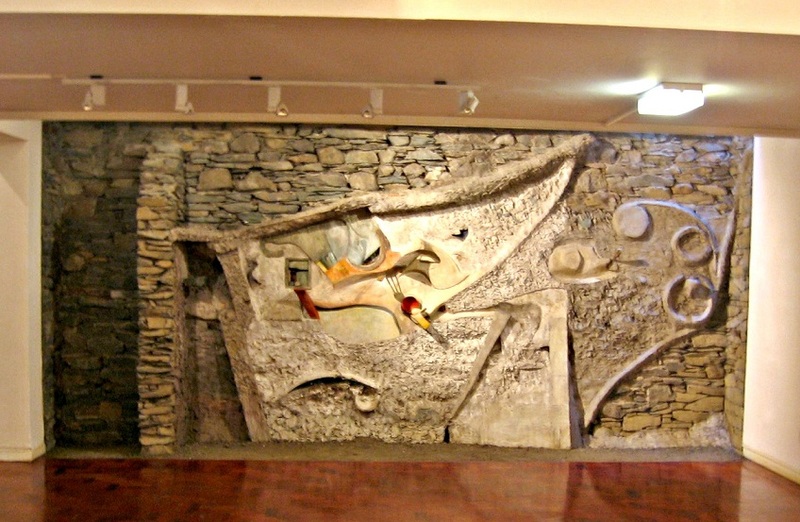 Current (as of 2015) Merz Barn interior west wall, featuring to-scale hi definition photograph of the actual Schwitters artwork. Although a gallant and admirable effort, surely no substitute for the actual Dada masterpiece integrated back into its intended exhibition setting. The important legacy of KS deserves no less. 1. Schwitters created the Merzbarn wall entirely from locally-sourced materials and found objects in the area around Ambleside and Great Langdale during 1947 / 8. It surely has no permanent place as an unnaturally severed artwork – a fish out of water, stranded in a gallery in a city museum many miles from its undoubtably-intended rural exhibition place. 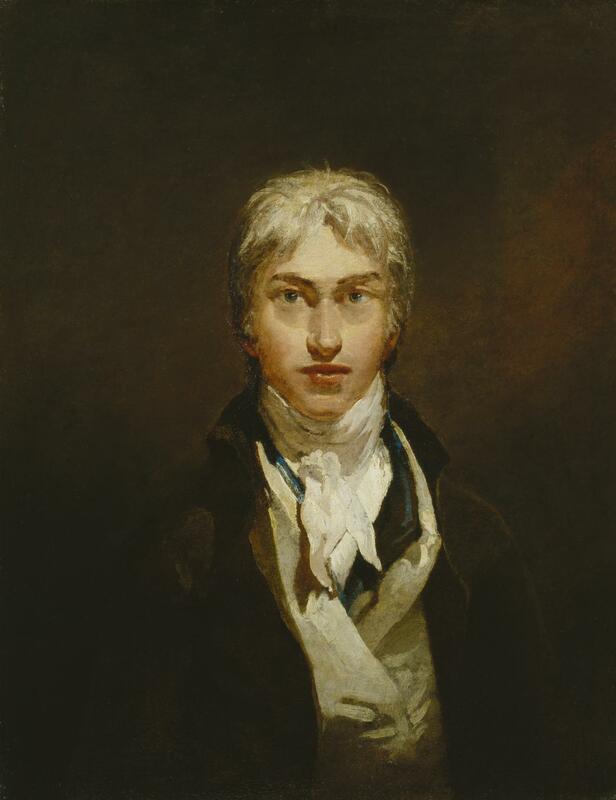 Unjustifiable in the technologically advanced 21st C. both morally and geographically – and also, in the final analysis, within art history itself. 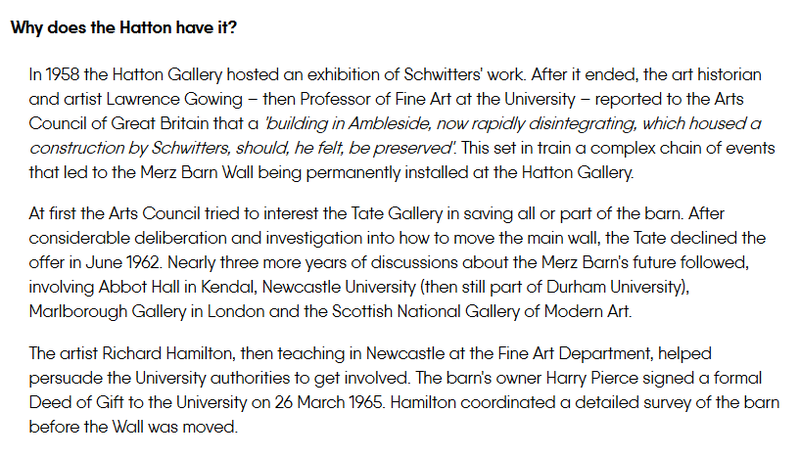 The Hatton Gallery was gifted the Wall in the 1960s by the then owner of the Cylinders Estate, Harry Pierce. 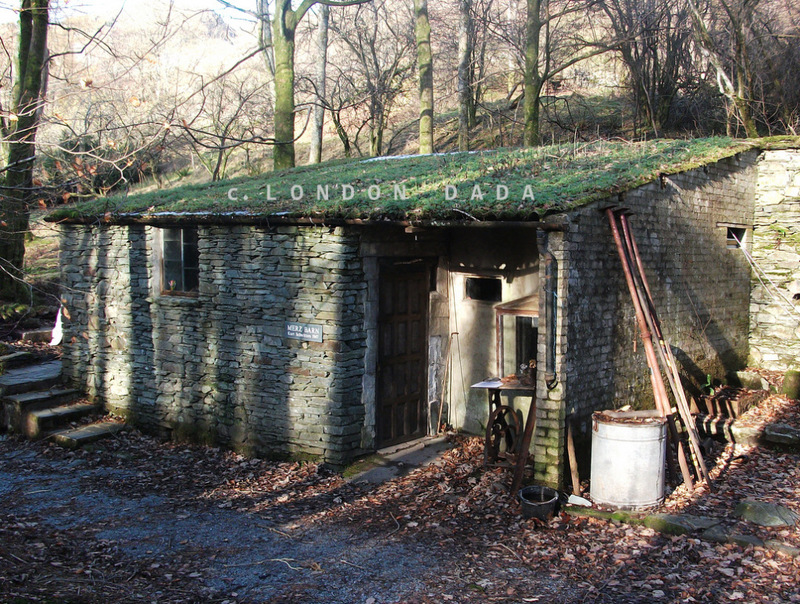 Equally, the directors of the gallery, in conjunction with the Arts Council, government and local authority, should recognize the strong nay overwhelming case, both morally and in the interest of art itself, for the Merz Barn Wall to be freely returned and re-incorporated into the Merz Barn – its intended and therefore real permanent exhibition place in Langdale, Cumbria. They need to step up to the plate and act in the same spirit of generosity and genuine concern for the future of this most important artwork as did Harry Pierce in 1965. 2. 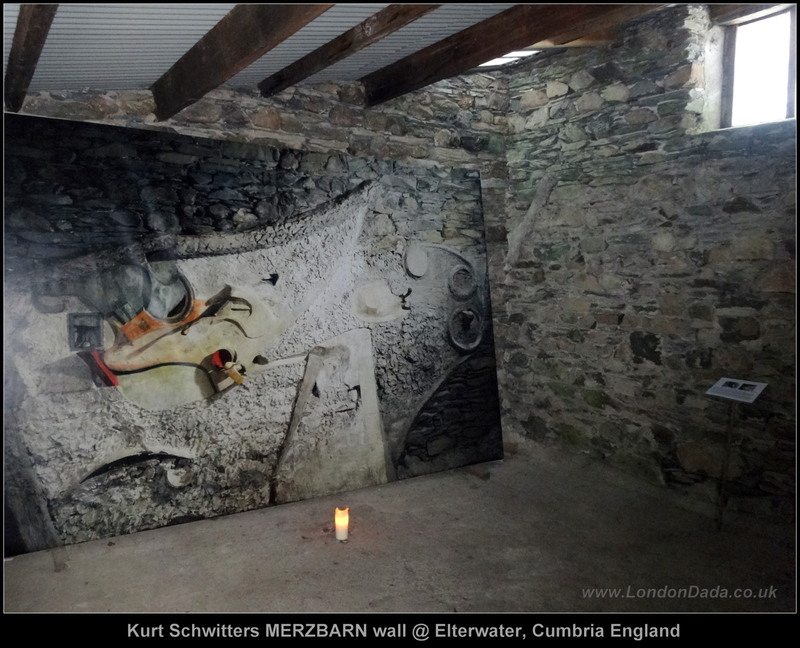 The Merz Barn wall was Schwitters’ last great artistic endevour; he personally chose the location for its creation and having built it literally into the barn wall at Cyliners in Elterwater, obviously intended for it to remain as a permanent fixture going forward. Therefore one can be confident in saying it would unquestionably have been Schwitters’ wish that, security and preservation matters guaranteed, it remain and be appreciated as wholly integral to the Merz Barn itself. It’s something almost akin to Duchamps’s Large Glass having had one of its two panes removed for preservation in the last century. Unthinkable that it wouldn’t nowadays be a priority for the art world that it reassembled as one as intended by the artist. 3. 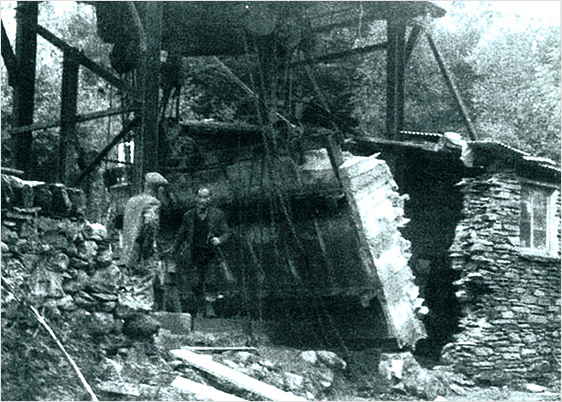 The Wall’s removal in the 1960s took place under very different conditions and when Schwitters’ legacy didn’t have the wide acclaim and appreciation it now enjoys. 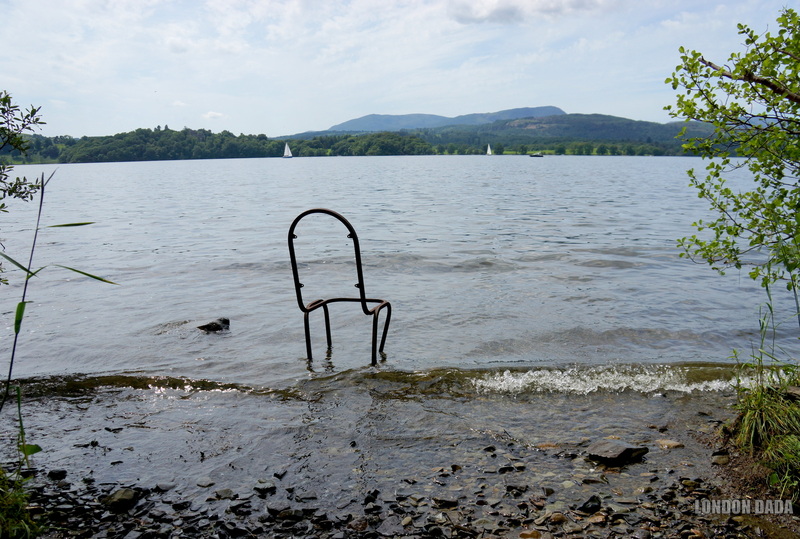 Accordingly it’s ever more vital that the German Dadaist’s last great work be reintroduced into its original and intended environment where there is now a sound support base and scope to fulfill its maximum appreciation in the form of the Littoral Trust. 4. There’s more than adequate funding available within the Arts Council budget to make the return of he Wall eminently practical, utilizing modern engineering and security technology along with SOTA preservation techniques, whilst ensuring sensitive development of the Merz Barn site along present environmental protection lines remains undisrupted post installation. 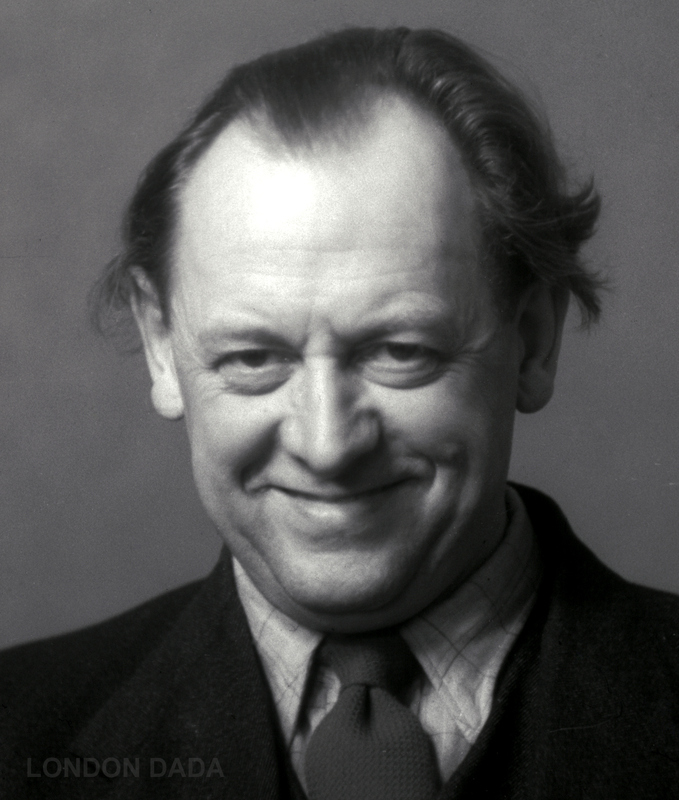 Summary; If Schwitters had intended his Merz Barn creation to be an independent standalone artwork, he would have surely created it on a large backing board base or framed metal mesh as its support within the Barn in the stead of building it directly into and as an integral part of the very structure of the Barn itself. To continue to separate the two whilst the means to safely re-integrate the Wall are eminently available given the good will on the part of the arts authorities concerned, is to seriously compromise and debase the meaning, feel and vital historical context of this most important international work of art. Whom from amongst the followers, admirers and advocates of KS, his legacy and his art could not – in principle – support this cause?